Kingdom of Belgium stamps were first issued in 1849. Belgium has the distinction of being the 9th country in the World to issue adhesive stamps for the prepayment of letter postage. Belgium, Gallia Belgica during the Roman Empire, has been around for over 2,000 years, but for much of that time, it was controlled by France and then by the Netherlands. The Belgians gained their independence from the Netherlands during the Belgian Revolution of 1830. The provisional government then invited Prince Leopold of Saxe-Coburg-Gotha, the Duke of Saxony (1790-1865) to become their first constitutional monarch. The prince was installed as Leopold I, King of the Belgians, in July 1831. With the selection of King Leopold I, the Belgian monarchy in the 19th Century became very closely intertwined with the monarchy of Great Britain. In 1816, still being a Prince of Saxe-Coburg-Gotha, Leopold married Princess Charlotte, the only child of King George IV (1762-1830) of Great Britain. Charlotte died the day after giving birth to a stillborn child in 1817. Had she lived, she would have become Queen Charlotte I of Great Britain upon the death of her father in 1830, and Prince Leopold would have become the Prince Consort of Great Britain! King Leopold's sister, Princess Victoria of Saxe-Coburg-Saalfeld (1786-1861), was married to Prince Edward, the Duke of Kent (1767-1820), who was one of the three children of King George III (1738-1820) of Great Britain. They had a daughter, Princess Alexandrina Victoria (1819-1901), who WOULD BECOME the Queen of Great Britain in 1837. King Leopold's youngest nephew on his brother's side, was Prince Albert of Saxe-Coburg-Gotha (1819-1861). In 1840, Prince Albert married Leopold's niece, and his first cousin, Queen Victoria. Thus by 1840, King Leopold I of Belgium was the brother of the Duke of Saxe-Coburg-Gotha, the uncle of the Queen of Great Britain, and the uncle of the Prince Consort of Great Britain. Leopold's family connections would enable the young Kingdom of Belgium to have a lot of leverage with its less-than-friendly European neighbors! Belgium stamps from 1849 through 1891 were inscribed in French, the official government language. Since 1893, all the stamps of Belgium have been inscribed in both French and Dutch, the two official languages of the country. Dutch is spoken in the Northern Flemish Region of the country, whereas French is spoken in Brussels and in the Southern Walloon Region of the country. Like most other countries, most of the Belgium stamps of the 19th Century and early 20th Century are regular definitive postage stamps. If collected in used condition, most of them are not terribly expensive, and they can form a very attractive looking classical collection. One interesting feature of the Belgium stamps issued between 1893 and 1914, is the addition of a perforated tab at the bottom of each of the postage stamps. The tab reads "NE PAS LIVRER LE DIMANCHE" in French, with the same phrase repeated in Dutch. This means "DO NOT DELIVER ON SUNDAY". The sender would leave the tab attached to the stamp, if they objected to their letter being delivered on Sunday. If the sender did not object to Sunday delivery, they could indicate their preference by removing the tab from the stamp. With the exception of some special issues for national exhibitions and of various high-denomination pictorial definitive stamps, commemorative Belgian stamps were not issued with any regularity until the 1930's. 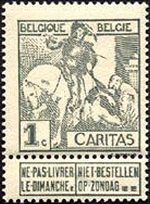 Belgian stamps issued for charitable purposes (semi-postal stamps) first appeared in 1910. The majority of the earlier issues were issued to raise money for the National Tuberculosis Foundation, the Red Cross, or to fund post-war reconstruction programs. Belgium is also famous, among stamp collectors, for its extensive series of Railroad Parcel Post Stamps. These were first issued in 1879, and they continue to this day. If collected in used condition, most of the stamps are not unreasonably expensive. As of 2005, almost 500 of these stamps have been issued. These could be a specialty in themselves, and they form the basis for many Trains on Stamps thematic collections, as well. Historical articles and reviews of the postage stamp issues of Belgium will appear in the link section at the top of the third column of this page.